Belichick likely thought that the Patriots would have at least two more possessions. If they failed to make the conversion the Jaguars would have been in field goal range without gaining a yard and needed just 18 yards for a touchdown. New England punted and Blake Bortles connected with wide receiver Dede Westbrook for a 61-yard touchdown on Jacksonville's first play after the punt to make it 31- 13. "Yeah, well, I mean, there was still, I don't know, eight minutes to go in the game or something like that," Belichick said. "So, just felt like that was the right thing to do at that point. We got good field position, but then we lost it." As for whether special teamer Brandon King should have handled the punt better because the Jaguars Telvin Smith -- lined up opposite King -- jumped offside (which would have resulted in a first down) but got back onside before the ball was snapped, Belichick thought that King did the right thing. "I mean, it's just one of those things that it's a close play and it just -- I don't know, I wouldn't fault anybody on this one. It could have worked out differently, but I think everybody's trying to do the right thing. I wouldn't second-guess anybody on this one," Belichick said. On his Monday conference call, Belichick was also asked about the acrobatic catch by Jaguars wide receiver Keelan Cole over Pats cornerback Eric Rowe. "Yeah, I mean, there are always things you can talk about on plays like that. I mean, it was a great catch," Belichick said. One way to prevent such a catch is to force the receiver to the sideline. "Yeah, well, that's part of it, no question. It depends on the play. I don't think on that one that was really that applicable, to be honest with you, but ... certainly sideline's part of the play, but depending on the relationship between the receiver, the defender, the ball and the sideline, it could be close to the sideline, [but it] doesn't necessarily mean that you can use it or that it's the play to make. 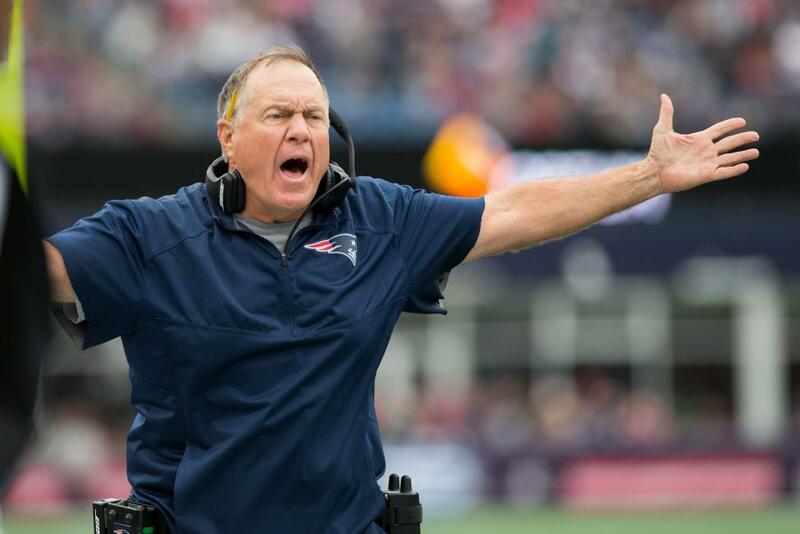 It could be, just would depend on how all those things line up," Belichick said. --WR Josh Gordon, newly acquired from Cleveland (the Pats gave a fifth-round pick to get Gordon), has only 19 catches since 2015. His best year was 2013 when he had 87 receptions for 1,646 yards. His best game came that season came against the Pats when he had seven catches for 151 yards and one touchdown. --TE Rob Gronkowski had only two catches for 15 yards against the Jaguars, whose corners did a great job of covering him outside while the Jaguars athletic linebackers gave him limited space with which to work in the middle of the field. --WR Cordarrelle Patterson has four receptions for 24 yards in two games and it wouldn't be a surprise if he is released when Julian Edelman returns in Week 5. He has two kickoff returns for 44 yards. -- CB Jason McCourty did an adequate job when he replaced Eric Rowe as No. 2 corner after it became clear that Rowe could not cover Jaguars WR Keelan Cole who finished with seven catches for 116 yards. --S Patrick Chung and DE Trey Flowers both left Sunday's game with a concussion. Neither was seen in the locker room after the game.